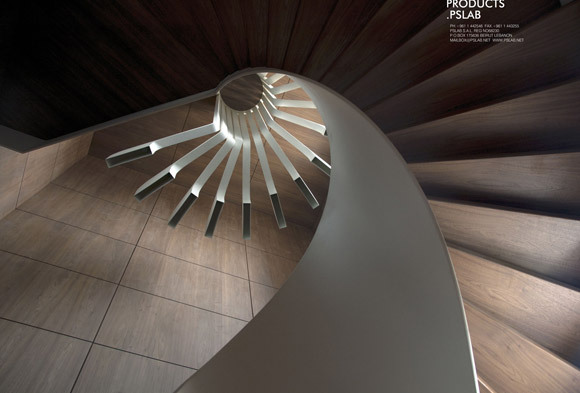 .PSLAB’s aim in this space is to highlight the distinguishing features and shape of the staircase, all the while offering a distinctive experience. The staircase is located in a rectangular space with uniform wood cladding on ceiling, floors and walls. It is characterized with a perfectly circular form, with the steps starting at the bottom floor and ending at the top floor with no other connecting points. 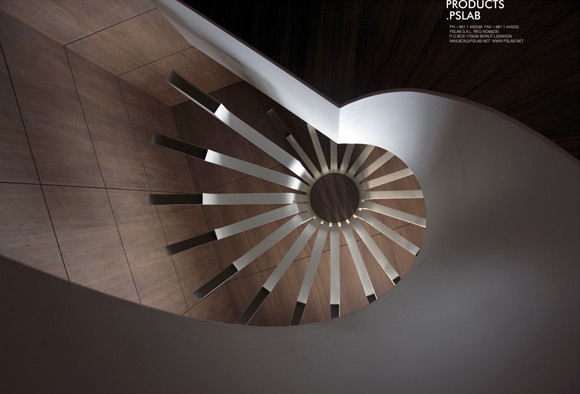 The staircase has a double volume height and spirals up, shaping its central core. 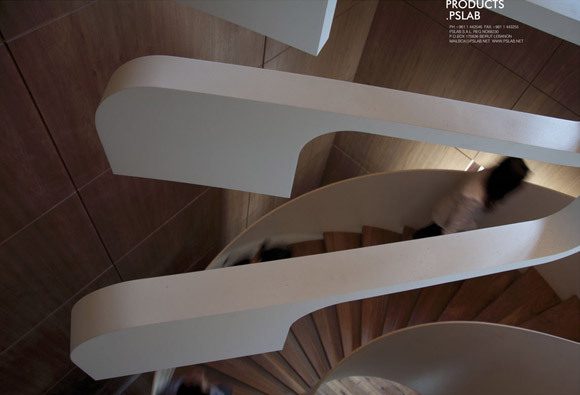 .PSLAB’s inspiration in this project came from the staircase’s main characteristics. The aim was to create a lighting concept that would not only mirror these distinguishing features but also complement the structure. The constraints encountered came not from the space but from the lighting fixture itself which required special handling to turn a concept into reality. An imposing insertion was made in the shape of a ceiling mounted fixture composed of hanging channels reaching out from the ceiling in a circular manner identical to the staircase. The lighting installation hangs from a partially recessed supporting plate with extruded profiles that serve to firmly set the vertical channels. These channels vary in length, giving the impression of an ascending structure. The hanging channels are equipped at their extremity with extended rectangular shaped arms of equal size. These extended arms house deep inside the light bulb and reach the center of each step, giving the impression that the fixture follows the staircase. The staircase’s core is represented in the lighting installation set above it with the channels positioned in a manner to create a core parallel to that of the staircase. The outcome is a grand scale lighting fixture with distinguishing architectural features that mirror and complement those of the staircase. The challenge resided in creating a balance between the off-centered extended arms and the thin channels that ensure ceiling fixation. The focus was more on the structure and how to reinforce it to create stability. .PSLAB overcame this challenge by reinforcing the channels with custom-made bent steel to carry the extended arms. The fixture, topped with a white powder-coated high-end finish to match the feel of the space, is reflective of the manual work and custom manufacturing skills that go into creating each lighting fixture at the .PSLAB factory. The end-result achieved is a direct outcome of the open dialogue between .PSLAB and Bernard Khoury and a reflection of the bespoke approach .PSLAB follows whenever working on a new project. The established and continuous dialogue allowed for a smooth collaboration and led the architect to place his trust in .PSLAB to create a lighting response that would be in cohesion with his vision for the space. 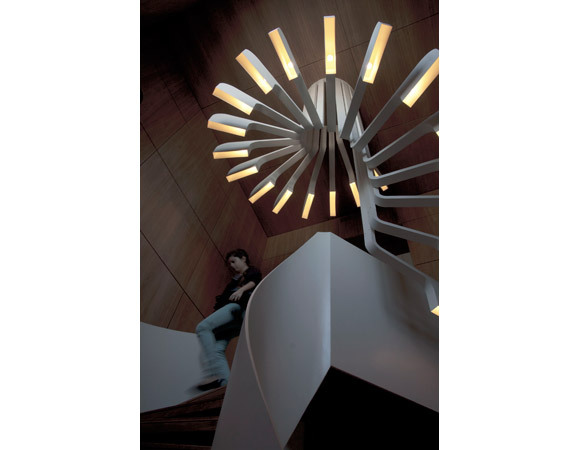 The resulting lighting fixture, characterized with architectural installation like features, is an offset of the staircase structure and responds well to the characteristics of the space. The ceiling mounted product encompasses both decorative and technical features, demonstrating .PSLAB’s expertise and scope of work. .PSLAB are designers and manufacturers of site-specific lighting products, founded in 2004 with over 100 team members and working out of four bases in Europe and the Middle-East including Beirut, Stuttgart, Bologna and Scandinavia. Our work can be found in private homes in London, art galleries in Beirut, restaurants in Rome, hotelsin Paris, conceptual boutiques in Antwerp, offices in Berlin and atevents and in public spaces worldwide. We are to lighting what haute couture is to fashion - through a customized project approach we offer a complete service which has allowed us to build ongoing working relationships with our collaborators. Our creative and technical teams work together on every aspect of product development, from concept to construction, giving us the edge which is at the core of the .PSLAB identity. Our concepts are born out of the individualities of a space and our products conceivedfor specific projects, custom-manufactured by our artisans in our workshop and hand-finished with minute attention to detail. Following our customized project approach, and the site-specific concepts we have created, have stemmed more than 300 lighting fixtures from past projects. These products are a clear reflection of the evolution of our creativity, designs and manufacturing skills. We believe it is the characteristics of a space and the open dialogue between our teams and collaborators that guide the lighting concept.